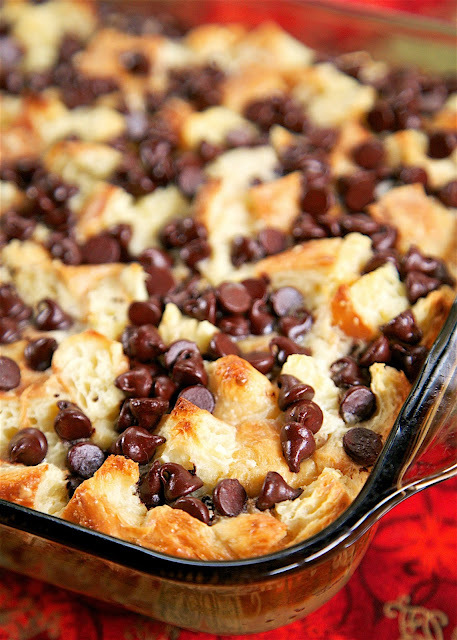 Chocolate Croissant Breakfast Bake - buttery croissants, cream cheese, sugar, eggs, milk and chocolate. Can assemble and refrigerate overnight. This is incredibly delicious! Can eat for breakfast or dessert. Perfect for Christmas morning!! 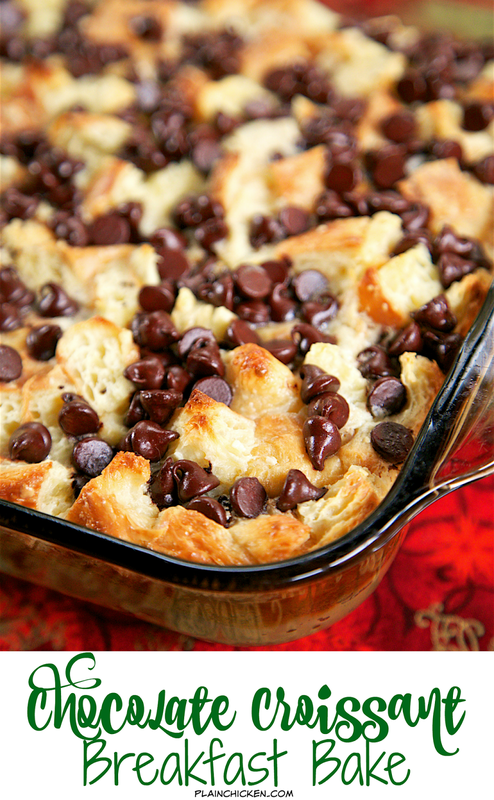 I can not begin to put into words how delicious this Chocolate Croissant Breakfast Bake tasted. 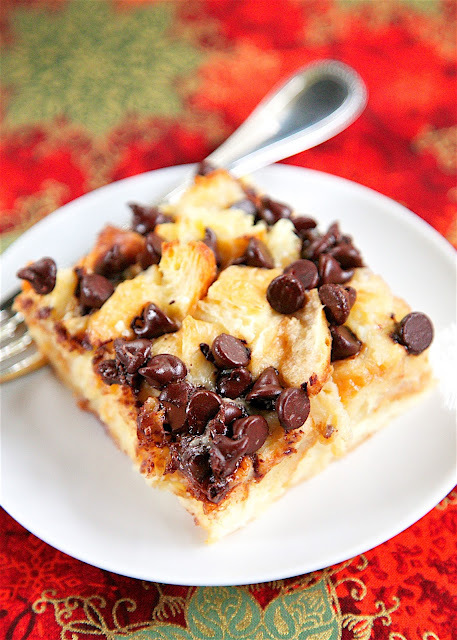 It was hands down one of the best sweet breakfast bakes I've ever eaten. Buttery croissants, cream cheese, sugar and chocolate - how could it not be amazing?!?!?! You must try this ASAP! I promise you will love it. Now, lets talk about croissants. The picture above is a croissant. You find them in the bakery at the grocery store or your local bakery. This recipe does NOT use refrigerated crescent rolls. 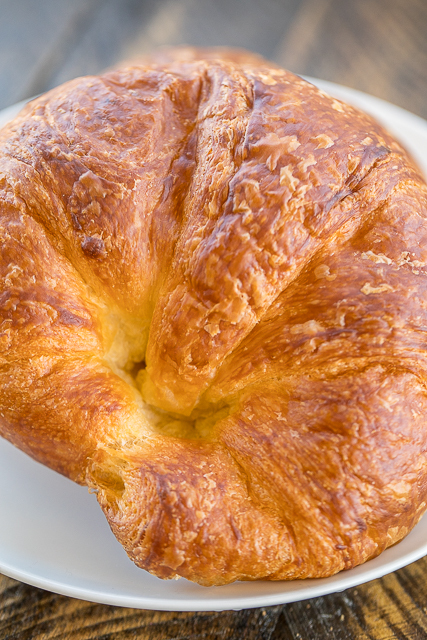 Croissants and crescent rolls are NOT the same thing. Please make note to use croissants that you buy at the store. This casserole can be made the night before and refrigerated overnight. This would be perfect for Christmas morning! 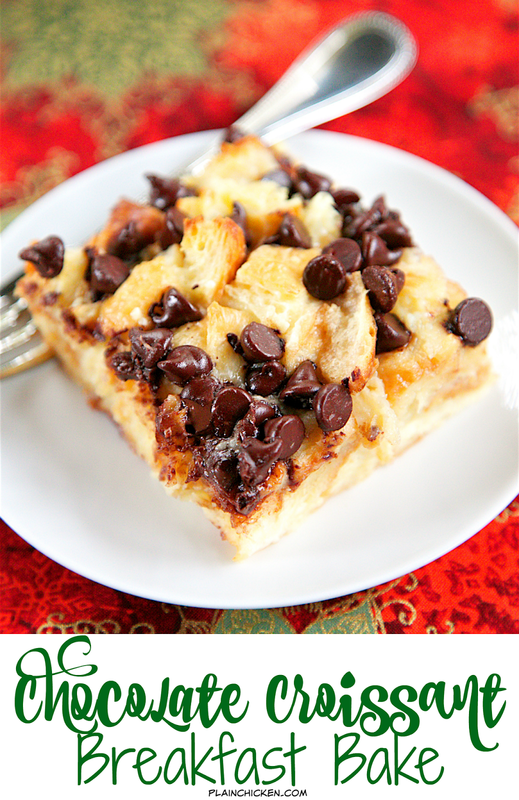 I love make ahead recipes, especially for the holidays! Easy preparation and easy clean up are a must this time of year! We ate this for breakfast, but it is also great as a dessert. This recipe is also easy to half and bake in a 9x9-inch pan if you don't need the whole recipe. We preferred to serve this slightly warm. If you are doing this for dessert, it might be good with a big ol' scoop of vanilla ice cream. Place croissant pieces in prepared pan. Sprinkle with chocolate chips. Beat cream cheese, sugar, eggs and vanilla in medium bowl with electric mixer until well blended. Add milk and mix until combined. Pour evenly over croissant pieces. Let stand 20 minutes or cover and refrigerate overnight. Bake uncovered for 35 to 40 minutes or until set in center. Serve warm. Do you just sprinkle the chocolate chips on at the end? Also, where do you find mini croissant rolls? I found the mini croissants in the bakery section at my grocery store. The chocolate chips are sprinkled on top of the chopped croissants before you pour the milk mixture over everything. This looks amazing! Do you use the already baked croissants from the bakery or the refrigerated dough? Thanks! Already baked croissants from the bakery section at the grocery store. Looks delish! I was going to ask the same question about where to purchase the mini croissants; glad to see the answer is already in the comment section! Can I make this ahead of time? Fully cook it and everything and then reheat it the morning I need it? Thoughts? Suggestions? I'd like to bring it to a breakfast potluck but would have to get up ridiculously early to fully cook it the morning of. I wonder if you would use unbaked croissants? I haven't used un-baked croissants in this recipe. I'm not sure how that would work. I should have read the reviews / questions down here first... I used refrigerated dough without baking it first and it did NOT turn out well. After baking for 45 minutes, it was still just like liquid and unset. But after baking another hour it did start to set up. Maybe mention in the recipe that the croissants need to be baked? The recipe is for prepared croissants from the grocery store. NOT refrigerated crescent roll dough. Ug, same thing here. Mine is currently a soupy mess. I think the user above meant it would be helpful to say prepared croissants in the actual recipe. I only read the comments because mine turned out horribly. I may try this semi-homemade recipe again now that I know what you meant. Mine did the same thing. Did it still turn out okay? Yikes! Just made mine and it came out lumpy too! Did it still taste ok? I used the croissants (Pillsbury)that you bake in the round roll. Chopped them up after baking and they were AWESOME! I beat the heck out of the cream cheese then added the eggs turned out very cream no lumps. Can I use regular croissants? I can't find the minis, but I've worked out that 6 full size ones would be the same ounces? Absolutely. You can use regular sized croissants if you can't find the mini. I am going to try this, and I am glad that I read the reviews. When I buy cream cheese, I make sure that I carefully read the ingredients. I learned the hard way that some brands do not mix well. Thanks for the recipe. I have never tried this in the crockpot. I'm sure you could, but I haven't tried it that way. Can you just with a wisk, r do have to a mixer? sure, just make sure to mix it really good.